Controversy exists today regarding the fate of the natural resources along the crest of the Niagara River gorge. The gorge is a seven-mile feature shared by two countries, the United States (eastern rim) and Canada (western rim) of this north-south trending geological feature. Government and quasi-government parks agencies and a power authority (New York State) own and/or manage the landscape along the gorge, not always in keeping with public views as to management goals or mandates. One major public-private initiative is the fate of the Robert Moses Parkway, a paved road running close to and parallel to the crest of the eastern rim of the gorge. Local ownership of this highway is apparently by the power authority (except for those portions, including the actual roadbed, that are owned by Office of State Parks, Recreation and Historic Preservation), but it is maintained by the New York State Department of Transportation. Currently there is a public movement to remove this parkway. As it parallels Lewiston Road, it can be considered to be redundant. This is not the case with the Niagara Parkway on the Canadian side that parallels the crest, and for which removal is impossible due to adjacent residential development. The Parkway begins upstream at the North Grand Island Bridge, follows westward along the upper Niagara River to the cataracts in the city of Niagara Falls where the Niagara Reservation, a State Park, is located. The road turns north here at the southern terminus of the gorge, leaves the Reservation, continues along the River, following its high bank (the gorge rim) along land in part apparently owned by NYPA with interruptions associated with the international bridges, other State Parks, and the State Parks maintenance garage. Downstream, the roadway bisects two State Parks (DeVeaux State Park and Whirlpool State Park) in the vicinity of the whirlpool at the base of the gorge, which is a feature of the Niagara River. There is another State Park, Devil's Hole State Park to the north, the power generating facility of the New York Power Authority (NYPA) at the northern boundary of this, the gorge terminating to the north at Lewiston, New York, at a State Park: Artpark, owned by NYPA but with a layer of management by New York State Parks. The single consistent public mandate for all the agencies is the preservation, protection and restoration of the native ecosystems along the gorge, along its top and down at the river's edge. 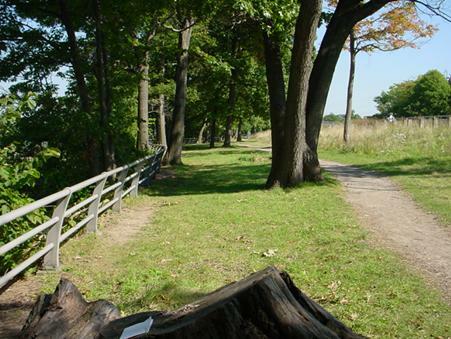 The present initiative to remove the Robert Moses Parkway, primarily along the crest of the gorge, is within the public interest in correcting what is considered to be an error, and to restore that landscape to its natural condition. To help give more precision to the exact condition that is desired in this respect, this author thought it expedient to investigate the natural botanical character of the present crest vegetation, primarily its trees, as trees are the primary natural control of the ecosystem that develops within and beneath the canopy. To begin this assessment, a field excursion on a single day, September 23, 2004, a bright, sunny day, was taken along the gorge crest from Devil's Hole State Park in the north, towards the south, or upstream, to the stone stairs just north of Whirlpool State Park, a distance of about one mile. In future papers, other sectors of the gorge rim will be discussed. The gorge of the Niagara River, part of the border between New York State and the Province of Ontario, trends in a north-south direction in the section between the Whirlpool (DeVeaux) stone stairs from gorge crest to shoreline on the upstream end (south) to the stone steps at Devil's Hole at the downstream end (north). The eastern, or New York State, shore of the river faces west and receives the brunt of the prevailing westerly winds as well as the afternoon sun. This condition tends to make the crest (historically known as the "High Bank" or gorge rim or crest, as opposed to the "Low Bank" or shoreline at the base of the gorge), generally arid. The low bank is in shade generally until noontime during the autumn. The sunlight exposure on the high bank intensifies during daylight hours in all seasons, and receives pressure toward aridity due to evaporation pressure from winds coming out of the west. This aridity is intensified because of soil depths varying from none (in alvar situations where the dolomitic bedrock is exposed at the extreme rim) to thin soil to soil of some depth in ancient river deposits. This soil absence or deposition is, in undisturbed areas, a function of the history of the river. When the cataracts were situated at the extreme north end of the present seven-mile gorge, at the axis between the towns of Queenston, Ontario, and Lewiston, New York, on opposite sides of the Niagara River, the actual shoreline of the river was approximately 250 feet in elevation above the level of the plain of the ancestral Lake Ontario, when its waters lapped against the foot of the north-facing, east-west trending Niagara Escarpment. The gorge is an invagination of this continuous escarpment. As a shoreline, the soils of what is now the crest were composed of river sediments with a mixture of erosion byproducts as terrestrial soils and bedrock interacted with the forces of the river water. Ancient shells and other biological debris characteristic of this habitat in the "upper bank" may still be exhumed from the soils along the crest. Soil depth varies as the curves in the river sometimes drew the force of the water against the bank, when erosion and scouring would occur, and times when the force of the water was directed away from the bank, when deposition occurred. Variation would also derive from the breadth and depth of the river channel, water flowing faster when the channel narrowed and slower as it broadened out. Each time the brink of the southward-eroding cataracts collapsed through various erosive pressures, as for example, the acidic waters dissolved ever widening chinks in the angular lines of breakage in the dolomite caprock, coupled with the forces of hydrostatic pressure (all still active at the brinks of the cataracts as they occur today seven miles south of Lewiston-Queenston), the banks of the river downstream of the brink became abandoned, leaving them "high and dry." The general impression is that the forest in this section of the gorge crest is a dry mixed Oak-Hickory woodland. 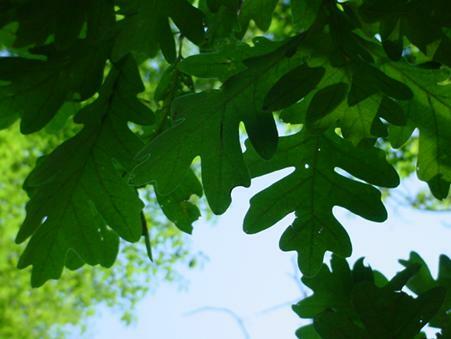 The dominant trees are Red Oak (Quercus rubra), White Oak (Quercus alba) and Pignut Hickory (Carya glabra-ovalis). Subdominants include primarily Hop-hornbeam (Ostrya virginiana), White Ash (Fraxinus americana), and Basswood (Tilia americana), with a little Sugar Maple (Acer saccharum), Black Cherry (Prunus serotina), Tulip Tree (Liriodendron tulipifera), rarely Black Oak (Quercus velutina) and Shagbark Hickory (Carya ovata), although I am guessing that at an earlier time there was more of this last tree species. I would suggest, after consultation with Ecological Communities of New York State (Reschke 1990) that overall this forest type conforms to the Appalachian Oak-Hickory Forest community in the Forested Uplands section of that booklet. It is a general woodland community that seems to occur "throughout upstate New York north of the Coastal Lowlands ecozone; most common south of the Adirondacks ecozone" (p. 55). Although this seems to be the general community type in this section of the crest, there are exceptions, such as the presence of a Chestnut Oak (Quercus muhlenbergii) community in the southern section of Whirlpool State Park,with a match across the river in Ontario on Wintergreen Flats. Another variation occurs where soils are deeper and Sugar Maple (Acer saccharum) becomes more numerous. Note also that an entirely different forest type exists perched within fissures and cracks in the dolomitic caprock of the gorge out of sight and out of mind, and that is the forest of Arbor Vitae or Eastern White Cedar (Thuja occidentalis L.) Although occasionally this evergreen tree is seen along the crest, in this section none were noted. Their presence is screened by the shrubs and trees just outside of the path-fence. Looking north, there are three habitats, the crest vegetation on the left beyond the fence where most of the native species diversity occurs, the central wooded area with canopy with the shrub and herbaceous layers absent due to maintenance by the State as a lawn. On the right is the Parkway and blue sky (canopy absent) with no shaded buffer. The tall grasses and forbs on the right hand slope are there because of a recent decision by the parks administration to not mow. For what purpose this policy is in effect remains to be seen. Most species growing up are weeds. In the foreground is a stump indicating eventual forest morbidity as present trees age and are not permitted to regenerate nor are they to be replaced by genetically identical offspring. The area studied is a narrow woodland strip (variably perhaps 30 to 100 or more feet wide) about one mile in length contained between the western boundary of the asphalted Robert Moses Parkway and the crest of the Niagara River gorge. On the crest-side of this strip a pedestrian path and a metal fence occur, the fence creating a barrier between the path and a special forest community in the narrow strip of land between the fence and the drop-off on the gorge rim. 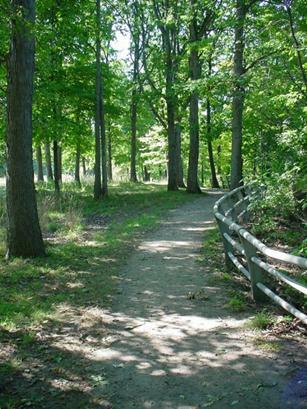 There is no buffer where the wooded tract abuts the Parkway, with lower growing plants, such as shrubs or small trees, to protect the woodland soils from the open, exposed Parkway. A forest buffering structure may be seen in the species composition in the extremely narrow strip (perhaps on average less than 10 feet wide) between the fence separating the path from the open crest of the gorge. 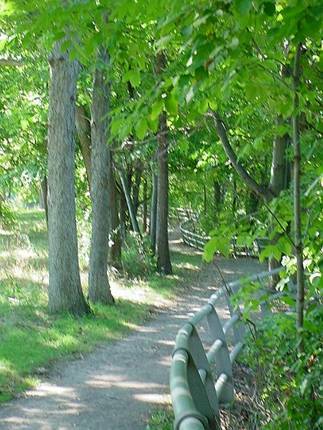 Such a habitat, protected by the fence, gives some indication of what the crest habitat might have looked like, especially since the woodland under study here is itself an edge, but an edge to the original woods in a more regional context that once occurred east of the Parkway in the urban areas adjacent to the gorge in the City of Niagara Falls. Looking north from the south boundary of Devil's Hole State Park one can see the unnaturally flat lawn area and how vulnerable to deterioration of the natural experience paving this path would be. Such paving would clutter an already over-modified environment and encourage guttering parallel to the pavement edges, encouraging erosion and the introduction of more weedy species. As at Whirlpool State Park, the habitat is somewhat disturbed. The canopy, as at Whirlpool State Park across from DeVeaux College woods, is essentially intact, casting a dappled shade. The habitat also has lost its shrub layer except on the far side of the crest fence where a variety of native and weedy shrubs occur. The woodland is relatively clean of introduced species (except invasive shrubs, as discussed below). The European Bird Cherry (Prunus avium L.), seen in so many Niagara woodlands, is absent here except for one old tree in more open ground. At this time of year (September), the herbaceous layer is composed of various Aster species and predominately the Zig-zag Goldenrod (Solidago flexicaulis L.) with a little Blue-stemmed Goldenrod (Solidago caesia L.) and rather tired Early Goldenrod (Solidago juncea Ait. ), because, as the earliest of the Goldenrods to flower (as early as July), it is well into seedset by late September. Among the Asters, the most striking and common is Arrow-leaved Aster (Aster sagittifolius) with white flowers in full sun, turning somewhat blueish in the shade and as the flowers mature. There was surprisingly little Tall White Aster (Aster simplex Willd. ), perhaps because this species is more characteristic of meadows in full sun. Everywhere the ground was covered with thin-stemmed grasses of the genus Poa, predominantly Kentucky Blue-grass (Poa pratensis L.) with mixture of Poa nemoralis L. Toward the crest there occurs the Canada Blue-grass (Poa compressa L.) which, despite its common name (Canada Bluegrass), is a European, for instance, species that has subsequently invaded the Niagara grasslands, probably at a very early date. These grasses are not typical of the original soil cover, as in what may be the only example of untouched crest vegetation I have seen to date (report in progress). The grasses are so dense that little bryophyte cover exists on the soils, another change from the original condition where the canopy was more closed, perhaps with the addition of a shrub layer. Our native Poa species generally have no rhizomes: Poa compressa and Poa pratensis both do, hence their extensive mat-forming colonial presence throughout the Niagara woodlands. Upon leaving the parking area near Lewiston Road at Devil's Hole and approaching the pedestrian overpass over the Robert Moses Parkway, several very mature trees occur: Red Oak (Quercus rubra L.), two Hickory trees with essentially smooth (i.e. hairless) leaves (Carya glabra (Mill.) Sweet, the Pignut Hickory), a large and beautiful, but decidedly horticultural Ginkgo tree (Ginkgoa biloba L.), two other Hickory trees with shaggy bark (Shagbark Hickory, Carya ovata (Mill.) K. Koch), two Tulip trees (Liriodendron tulipifera L.), more Red Oak, and Black Locust trees (Robinia pseudoacacia L.). On the urban-side overpass abutment there was a Siberian Elm (Ulmus pumila L.), an alien species of street tree. On the gorge side of the overpass there was a Norway Maple planted (Acer platanoides L.), the standard regional street tree, as well as two very large, very old Hawthorns that the New York parks administrations have used to plant in such areas, but which is alien to the region, occurring naturally south of our area: the Washington Thorn (Crataegus phaenopyrum Medic.). This shrub has been planted also at Devil's Hole in the abandoned northern crest sectors of the park, at Whirlpool State Park, Goat Island and other areas. Immediately an American Basswood tree (Tilia Americana L.) presented itself on the gorge-side of the path fence. This and other native species occur on both sides of this fence, creating a canopy that extends from the Parkway on the left (facing south) to the fence and gorge crest on one's right. The Hop-hornbeam (Ostrya virginiana (Mill.) K. Koch) is a subdominant whose frequency rises and falls in swarms along the path, as with the dominant trees. Here there are the amazingly plentiful of the Hickory species Pignut and Small-fruited Hickory (Carya glabra (Mill.) Sweet and Carya ovalis (Wang.) Sarg.) with these medium to huge-sized compound leaves. Remains of their nuts litter the ground. There is more Hop-hornbeam (whose leaves resemble Birch because it is a member of the same family: Betulaceae). As flowering herbs appear, the Goldenrods already mentioned, at least three species, various Asters, White Snakeroot (Eupatorium rugosum Houtt., there is one Shagbark Hickory on the crest, the tired remnant of a spring wildflower population of False Solomon's Seal (Smilacina racemosa (L.) Desf.). There is no getting around the sad thickets of Buckthorn (Rhamnus cathartica L.) that crowd the crest along the fence in their tedious monoculture. This is the number one enemy of natural or passive regeneration schemes, the number one invasive species in both natural and disturbed areas. Anywhere and everywhere this shrub should be eradicated. One escaped shrub of the alien English Hawthorn (Crataegus monogyna Jacq.) was seen. In light-wells where the canopy has been broken by tree removal or tree-fall, weeds flourish: the weedy Poas, the Bluegrasses already mentioned, and the Orchard Grass (Dactylis glomerata L.) that flourishes in the unmown open areas in the south sector of Whirlpool State Park, where individual culms can rise as high as five feet in dense lawns with other weedy species. Note the proliferation of these plants along the Parkway where the canopy ends. A very small number of Sugar Maples (Acer saccharum Marsh. ), only seven inches diameter at breast height, are encountered, which is unusual as most of the native forest in the region has been characterized as Beech-Maple dominated. Here along the crest it appears to be Oak-Hickory, as discussed above. A Black Cherry (Prunus serotina Ehrh.) crops up here and there all the way to Whirlpool State Park upstream, to the south. A small amount of weedy Honeysuckle occurs across the fence (Lonicera sp. either L. tartarica L. or L. morrowii Gray). More Pignut and Small-fruited Hickory with festoons of River Grape (Vitis riparia Michx.) occur, the Red Oak becomes more conspicuous. Further on is another vine, one of the two species of Virginia Creeper in our area, and, some say, the only native one, Parthenocissus vitacea (Knerr) Hitchc. A large Norway Maple occurs on the crest, which should be removed, then another. Six Hop-hornbeams line up in a row, then six Black Locusts (Robinia pseudoacacia), which should be replaced with native trees. Black Walnut (Juglans nigra L.) is very infrequent, probably because it has a rather opportunistic capacity to establish itself on ridge tops and the tops of talus slopes, whereas here there is a fully mature canopy on flat land. Two White Oaks (Quercus alba L.) appear. Their numbers increase until they replace the Red Oak in places. On the crest the round, smooth leaves of a native species of Juneberry or Shadbush (Amelanchier sp.) appear, a small tree. These trees hide in their summer-autumn somberness their earlier beauty as they shoot their whitened canopies open in early spring along the gorge crest and talus forest on both sides of the river. A modest population of spring wildflowers can be seen now, among the Goldenrods and Asters, and here there is an Early Meadow-rue (Thalictrum dioicum L.), part of the original crest woods herbaceous flora. A single large trunk of the alien tree, the Little-leaved Linden (Tilia cordata Mill.) grows on the crest. Noteworthy are three populations of Witch Hazel (Hamamelis virginiana L.) growing beyond the fence. It is nice to see this native shrub upstream because the only populations I am familiar with occur in the downstream woods section of DeVeaux College woods. It is a species that should be part of a restoration of the shrub layer under these trees in similar native species assemblages as at DeVeaux. Another native species seen here was the Red-osier Dogwood (Cornus stononifera Michx.). More Shadbush appeared, but then disappointingly, more Black Locust. Near the parkway margin one Honey Locust (Gleditsia triacanthos L.) could be seen. This is another inappropriately planted replacement tree that should be removed as it is capable of spreading in the wild. More White Oaks of great size appear as the walk progresses southward, a large grove opening up as the path swings out into the cavity of the gorge, creating a wider space between the Parkway and the crest. Here there are more numerous native wildflowers, particularly the Arrow-leaved Aster and the Smooth Aster (Aster laevis L.), the only plant seen on this day. There is a Black Walnut tree and chipmunks, then Basswood. Species of fungus spring from the ground. Here the White Ash (Fraxinus americana L.) appears. Its numbers will increase as one continues to walk upstream. The forest continues from this grove in a mix of Basswood, Hop-hornbeam, Red Oak, and White Ash. Two single stems of the spring-blooming Smooth Rock Cress (Arabis laevigata (Muhl.) Poir.) can be seen in fruit, clinging to the bases of White Oak trees. This is the only habitat in which they can exist as long as the mowing continues that destroys their ability to establish themselves. The native shrub Round-leaved Dogwood (Cornus rugosa Lam.) can now be met in the woods beyond the fence, separating the path from the gorge, a striking shrub in its genus, found, together with the Pagoda Dogwood (Cornus alternifolia L.f.), on the talus slopes below. A few stems of the Bottle-brush Grass (Hysterix patula Moench) grow on the crest. Just beyond the stone bridge over the dried up stream channel, at the only station where Garlic Mustard was seen to have become established, the Paper Birch (Betula papyrifera Marsh.) appears and will continue to be a woods component as one continues upstream to Whirlpool State Park. This is an early colonizer in the disturbed talus slopes below and in newly exposed habitat along the river's edge. This walk along the crest ends with a rather steep slope down to the head of the stone stairs (DeVeaux or Whirlpool Steps) leading down to the river's edge. This declivity is dense with vegetation both weedy and native, with Slippery Elm (Ulmus rubra Muhl. ), White Ash, Buckthorn, Basswood, Paper Birch, Bird Cherry, Garlic Mustard, Dandelion (Taraxacum officinale), Buttercup (Ranunculus acris), and Deadly Nightshade (Solanum dulcamara). This area would be a good candidate for removing periodically the alien species and leaving the native ones. This area has been highly modified and disturbed, and is a good candidate for restoration work. View looking upstream (south) toward the Whirlpool and Ontario, Canada. This section of the gorge has stunning views from the pathside. A comparison with the gorge rim walk on the Canadian side for visual grandeur might be instructive. Note should be taken that there were no coniferous species observed in the tree component in this strip of woodland. Old images and photographs, however, show that such trees once occurred along the rim. The two species that are absent today are the White Pine (Pinus strobes L.), which was most likely a crest species, and Hemlock (Tsuga canadensis (L.) Carr. which would require a more moist, protected station, and which trees do occur on the moist, cool talus with its deeper soils below the crest. Such trees were eliminated from this area during the height of the lumber and leather industries in the Tonawandas and elsewhere locally in the early decades of the twentieth century. The tannins in Hemlock were particularly valuable. It is possible that the complete absence of White Pine may have been due to the White Pine Blister Rust, caused by Cronartium ribicola (Uredinales: Cronartiaceae), a rust fungus presumed to be native to Asia and brought into the United States from Europe at the end of the Nineteenth Century. The alternate host to White Pine is a plant from the genus Ribes, our Gooseberries or Currants. The Niagara Gorge flora has numerous species and individuals of this genus throughout, but it seems to be mostly the European Black Currant that is considered to be the alternate host. One of the most striking co-dominant trees along the crest is a species of Hickory. It is a curious species in that group, genus Carya, because people are still debating whether specimens of it belong to one or two species groups: Carya glabra, with C. ovalis as a synonym, or Carya glabra as distinct from Carya ovalis. Botanists who insist that these are two distinct species instead of one variable one, will enjoy selecting one species or the other out of the relatively large population of this tree along the crest. Most of the trees have five leaflets, but several occur with seven, and the leaflets of these latter are very large, compared to the 5-leafleted type. All the leaflets of these trees are conspicuously free of hairs. All the other species of Hickory in the area are very hairy, especially on the underside of the leaves. The crest hickories have a pleasing freedom from hairs that makes them cool to the touch on a hot September day. Some of the trees have leaves with hairy rhachises, some smooth. In all cases there are scattered dark brown glandular dots on the underside of the leaves near the corners of the little veinlet areas (areolae), and often pubescence underneath in the vein angles. Seven leaflets correlates with C. ovalis, as does a general shagginess or peeling quality to the bark. Some leaves of this type have very few of the glandular dots characteristic of both tree forms. There are many trees with smooth bark (the C. glabra form), and plenty with sort-of shaggy, sort-of smooth bark, in other words, such variability that it is likely to be one variable species after all. The definitive character has to do with the fruit: those of Carya ovalis (Wang.) Sarg. in late fall when the fruits are fully mature, the husks split apart all the way from the tip to the base. In Carya glabra (Miller) Sweet, the husks split only halfway down the fruit. This leaves the observer wondering, when viewing a half-split husk whether the fruit was interrupted from splitting all the way or not. Perhaps it is best to see these as one species, and so they are treated here. The stand of these kinds of hickories along the crest is a wonderful scientific laboratory to study this interesting problem in plant taxonomy and would prove an interesting learning challenge to student groups as well as individuals. Who knows, but a case could be made that these trees represent two distinct species that can be distinguished satisfactorily from one another in this particular locality. There are only two other Hickory species that I have so far found along the gorge crest, and these are first Carya ovata (Miller) K. Koch, the Shagbark Hickory, conspicuous for its hairy leaves and leaf-rhachis, with a lingering, rather dense tuft of hairs near the apex of each tooth on the leaflet, and its thicker husk (3-10 mm whereas those of Carya glabra 0.6-2 mm thick). The nuts of Carya ovata are larger, too (2.1-4.1 cm long, but only 1.6-3.2 cm in Carya glabra). The overlap in measures is clear, but still, the Carya glabra along the crest has overall smaller nuts than the relatively fewer trees of Carya ovata (these at Whirlpool State Park with several large trees by the Main Street (Lewiston Road) parking area at Devil's Hole beside the path leading to the parkway overpass, Main Street side). One tree of Carya ovata was noted along the crest. The second, even less common Hickory is Carya cordiformis (Wang.) K. Koch, the Bitternut Hickory, with very hairy leaves and fruits with prominent wing-like ridges along the sutures. These trees never have leaves with five leaflets (always 7-9 generally narrow leaflets). The most definitive character of this tree is the bright orange, long, skinny bud at the ends of the twigs (those of all other hickories are dark brown to nearly black). This bud is so distinctive that some taxonomists are inclined to set this species apart in its own category. Among the Hickories, other than numerous trees of Carya glabra, only three trees of Carya ovata were seen on this walk between Devil's Hole and DeVeaux Steps on this particular day (September 23, 2004). People Using the Parkway and the Forested Path. Equally numerous groups were seen to utilize both the closed-off Robert Moses Parkway lanes and the forested path along the fence nearer to the gorge crest. This was during a workday, but there was a surprising number and diversity of pedestrians, both male and female, young and old, singles, couples and in groups. People employing strollers with infants, of course, used the paved Parkway. Parkway users were exposed to the full September sun, whereas there was a constant cooling shade along the path. Oddly enough, it was the joggers who enjoyed the uneven path and shade, although the newly paved Parkway lanes were conspicuous. These joggers were also encountered along the lower path near the water's edge where natural variation in the path surface is more extreme. The unevenness of terrain appealed to the fitness challenges required by this form of activity, as well as the aerobic challenge of using the stone stairs at both Devil's Hole and the DeVeaux (Whirlpool) stone steps. One couple of elderly women had easily traversed the native path from Whirlpool State Park upstream to the stone steps. They were the only ones who recognized me as a botanist. A naturalist's guide to the crest path would be a good resource to provide users of the crest paths on both sides of the river, and it is hoped that this essay may provide useful information for such a guide. Fortunately, although instances of the establishment of alien or noxious species exist, they are so infrequent that their removal should not be difficult, especially when replaced with an appropriate native species. The planting of Black Locust (Robinia pseudoacacia L.) anywhere in a native ecosystem is not advised. It is not a restoration tree and its planting in an area with a restoration mandate, as on the crested areas on the south side of Goat Island, is to be avoided. These trees, much like Rhus typhina, the Staghorn Sumach, form clones that are difficult to eradicate (as on Navy Island, Ontario). The Ulmus pumila L., Siberian Elm, planted on the urban side of the Robert Moses Overpass at Devil's Hole should be removed as it is probably at least one of the Mother Trees whose seeds have become established down in the talus and basal forest within the gorge. Numerous tree species, such as Box Elder (Acer negundo L.), Horse-chestnut (Aesculus hippocastanum L.), Norway Maple (Acer platanoides L.) and Honey Locust (Gleditsia triacanthos L.) have found their way into the lower gorge slopes from streets above and the lower slope forests need to be protected. Buckthorn (Rhamnus cathartica L.) that crowd the crest along the fence, is the number one enemy of natural or passive regeneration schemes, the number one invasive species in both natural and disturbed areas. Anywhere and everywhere this shrub should be eradicated. In any ecotourist program, the dominance of invasive taxa within a world-class ecosystem is detrimental to the quality of the visitor experience and a threat to the long-term viability of the plant communities that the natural-history tourist has come long miles to experience. To those familiar with nature, Buckthorn is easily recognized and a blow to the aesthetic enjoyment of the woodlands. One escaped shrub of the alien English Hawthorn (Crataegus monogyna Jacq.) was seen. Unlike the above species, removal of this plant should be no problem at all. This is also true of the single instance of the European Ash (Fraxinus excelsior L.). The same may be said of the Honeysuckles, Lonicera tartarica L. or L. morrowii Gray). I suspect that the reason the Honeysuckles are such an overwhelming nuisance in the talus slopes upstream is that they were planted abundantly a long time ago and have had over a century to develop their populations. Orchard Grass (Dactylis glomerata L.) flourishes in the unmown open areas in the south sector of Whirlpool State Park, where individual culms can rise as high as five feet in dense lawns with other weedy species. Here and there the parks administration has cleared away the crest vegetation to provide spectacular views of the Niagara River gorge from a vantage point at least two hundred feet above the water's surface. These vantages were identified and established nearly a century ago, and enhance the interesting winding character of the crest path and the fence along it. The path itself, from observing what is probably the only remaining remnant of the aboriginal crest, follows a natural trail made by animals who migrate along the crest, quite close to it, and around which they would excavate their burrows. The ever-present chipmunk population that can be heard chipping most likely makes good use of these crest trails. Problems occur, however, when the cutting for views is indiscriminate and too extensive. It is a disappointment in these areas to find weedy thickets of Buckthorn and Garlic Mustard (Alliaria officinalis Andrz.) amidst the native species. This, together with the planting of inappropriate, weedy trees and shrubs as well as the removal of old trees, creating light-wells, or having the area between the crest and the Parkway too narrow to develop a forest canopy, contribute to a degradation of this native woodland. One good strategy when cutting over an area periodically, is to return later in the season to cut away the weeds that will re-grow, and leave the native species that re-grow with them. This is reminiscent of the biblical parable of the tares and the wheat. Let both grow up, but remove the weeds before they set seed, leaving the native species to establish themselves undisturbed. This woodland habitat, disturbed as it is, is remarkably self-sustaining if only shocks to the balance of shade and light were not made, nor interference allowed with the structure and population mix of native species. 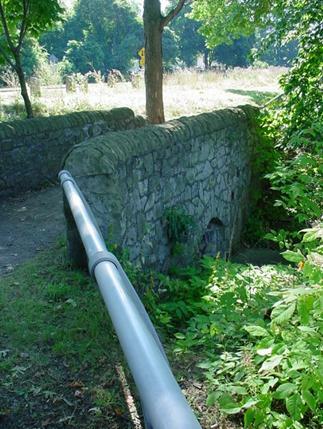 This old stone bridge spans a water course that is dry due to construction of the Parkway. To restore stream function at this site would be consistent with ecological restoration objectives and would return some of the pre-Parkway moisture regime to the gorge slopes below. Note the strength of the September sunlight in canopy-free areas adjacent to the Parkway in the distance and the weedy meadow generated by this condition. The stone bridge over a dried-out stream bed is charming to come across along the hike, and one might expect that a few carefully placed old logs or river stones of native rock would be welcome places to rest and eat lunch. It is unfortunate that, due to construction of the Parkway, as in other areas along the crest, such as at Devil's Hole (Bloody Run Creek outlet) and the natural Gill Creek outlet downstream near Artpark to mention only two, that the natural drainage as waterfalls or seepage through bedrock is diverted, and the channels and coves are dry and weedy from salt runoff in winter. To re-establish the outflow at this stone bridge along the crest trail would be a good restoration target. 1. To protect the canopy, the careful removal of ecologically inappropriate trees: Black Locust (Robinia pseudoacacia), Siberian Elm (Ulmus pumila L.), Norway Maple (Acer platanoides L.) is advised, and replacement with native stock (Oaks, Hickories, Walnuts). 2. Since Ginkgoa biloba does not grow spontaneously, it is benign. Its planting should, however, not be made in restoration areas. 3. Although the Washington Hawthorn (Crataegus phaenopyrum Medic.) does not appear to be spreading (there is a colony of this shrub abundantly growing in the middle and northern old sections of the upper crest of Devil's Hole beyond the cove area, possibly from suckers) planting of this inappropriate tree should be ended and greenhouse-grown native species used or selective transplants from demonstrably regenerating areas (old fields). Native Hawthorn species in the Niagara area: Crataegus crus-galli, C. puncata, C. mollis, C. succulenta, C. chrysocarpa and C. flabellata. All of these shrubs can be found with various frequencies throughout the Niagara parklands, a good suite of them at Buckhorn Island in the shrubby regeneration areas around the Interstate 90, and abundant in non-park areas such as north of the Youngman Highway (I 290) east of the South Grand Island Bridge, for example. 4. To restore and enhance the ecosystem either with or without the removal of the Parkway, primary consideration should be to reestablish the trees to protect and buffer the canopy layer. Based on information to be presented in a future posting, the canopy effect should not, however, be as dark as that in the uncut, old-growth woods in the upstream section of DeVeaux College woods. What is needed is a more open canopy producing a dappled light exposure on the ground that is conducive to a diverse shrub layer. This layer would include various Hawthorn species, those of Dogwood (Cornus spp. ), of Witch Hazel and others that can be determined from various publications presently available. The advantage of the prevalence of tree species whose fruits are of the nut variety makes harvesting these fruits easy for both technical and amateur involvement in reforestation with genetically authentic Niagara stock. A nut harvest can be employed in germination and growth efforts in greenhouse contexts that abound in the Niagara region on both sides of the Niagara River. It would not take an enormous number of trees to implement a viable restoration project. Amateurs and professional nut growers alike can experiment all they like germinating Oak, Hickory, Black Cherry and Walnut nuts and drupes from the gorge crest crop. The problem would be to reestablish such stock within a professionally viable restoration plan; the staff and plan are yet to be established, as well as the authority to do so. With or without the removal of the Parkway, trees can be established along the median strip areas between the north and southbound lanes, on the verges bordering the blacktop and even to involve homeowners whose back lots abut on the Parkway to replace their weedy tree species with local native material. Cooperation from the street department of the City of Niagara Falls in planting such trees along streets near the gorge rim can be developed and encouraged. Niagara University, which has an enviable location and association with the Niagara River gorge can take a leadership role in restoring areas on campus, or simply growing stock from native fruits and establishing them on campus, in cooperation with their grounds maintenance department. The grounds of the New York Power Authority, also situated at the gorge crest could benefit from using native-grown tree and shrub material in transforming their lawnscapes in and around the forebay and penstock area, the public information facility built over the gorge crest, the transformer area and south of this, the naked areas along the Robert Moses Parkway by the water intakes. A nursery in fact could be established in these blighted areas where implementation experiments could be performed and where sprouted material could be cultivated until mature enough for transferal to critical areas along the gorge. By that time a legitimate plan for restoration with implementation authority could have been developed and initiated. It is rather urgent to begin taking such steps as the tree species in question are notoriously slow growers, unlike Maple species, for example. Young trees are an important component of the missing herbaceous and shrub layers under the canopy along the crest. As such they contribute an important element to recovering the original structure of the crest flora (the shrub or intermediate layer between the grasses and flowering plants and the tree canopy). Note that there is nothing to prevent private and municipality partnerships in the area surrounding the gorge in generating and establishing native stock on private and community land. 5. Thought should be given to the careful reintroduction of the White Pine into the crest canopies in the public lands along the Niagara River. Although it is presumed that most of the absence of this tree is due to the local logging industry that collapsed with the deterioration of the forests of the Niagara Region, when the industry moved westward into states such as Michigan, some consideration should be made that this tree succumbed to the White Pine Blister Rust. Although species of Ribes do occur in the Niagara gorge flora, it is the European Ribes introduction that is targeted by governmental quarantines. Surveys of recent mortality of Eastern White Pine in natural habitats in the northeastern United States indicate that the mortality percentages due to this disease are quite low. Specimens of White Pine occur on Goat Island (these may be introductions) without apparent disease, even though Ribes grows on the island and even though the trees are subjected to prevalent moisture from the spray zone of the falls in late summer and early fall, a time when White Pine, especially young trees, are vulnerable to infection. Further down in the dappled shade along the drier crest, especially at Whirlpool Point on the upper and lower banks where White Pine proliferated, it would seem that a re-introduction might be desirable. Note should be made of the presence and expanding populations of Barberry (Berberis vulgaris L.) along the crest and elsewhere in the public lands. This is the alternate host of the stem rust of wheat and all such wild (and horticultural) establishments are recommended to be destroyed. This does not include the common foundation shrub Berberis thunbergii DC., also growing spontaneously in the parklands, and which is not a host for this disease. 6. The canopy is never to be interrupted as to allow light-wells, or areas with intense insolation. to occur. These promote the development of lawn or meadow species, primarily of a weedy nature. 7. The native herbaceous species seen are typical of the ancestral species composition of the crest flora. Their population expansion and reestablishment elsewhere along the crest is to be encouraged in restoration plans. 8. It is strongly suggested that the path never be paved. Paving would encourage the development of weeds along its borders as well as erosion as runoff from rains and melting snow would be channeled along pavement margins. 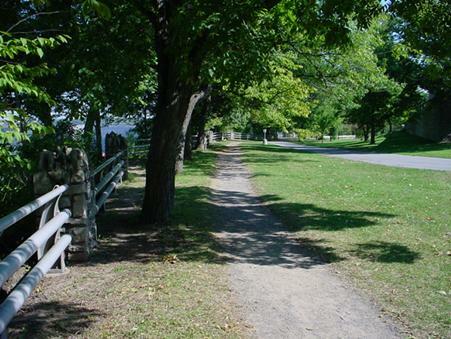 The unpaved condition adds much to the perception of a rural experience, the intervals of clay soil and gravelly, stony additions or exposed soils contributes to the variety of the path experience. d. other general areas on both sides of the Niagara River that appear to be useful in providing appropriate data, historic descriptions of the area, community structures in similar situations (wooded calcareous gorge crests facing the western sun and the prevailing westerlies). Similarities may be sought in other areas in New York State in the Appalachian Oak-Hickory Forest community association described by Reschke (1990). American Basswood (Tilia Americana L.
Paper Birch (Betula papyrifera Marsh. Red Oak (Quercus rubra L.
Small-fruited Hickory (Carya ovalis (Wang.) Sarg. Little-leaved Linden (Tilia cordata Mill. Fungus populations and Chipmunks were also noted. 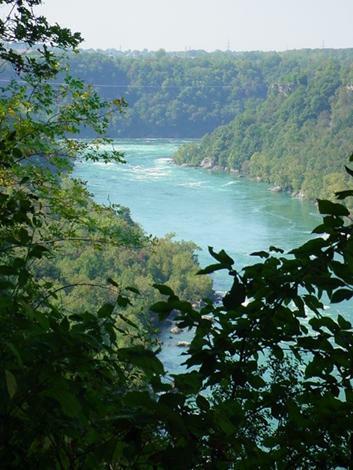 Unlike other areas along the seven-mile length of the gorge crest on the New York State side of the Niagara River, the crest section between Devil's Hole State Park on the north and DeVeaux (Whirlpool) Steps to the south, at the north extension of Whirlpool State Park, retains many of its original tree populations, a condition essential to a credible plant community restoration. Due to the high number of nut-bearing tree species, this woodland community is designated as most like the Appalachian Oak-Hickory Forest community in the Forested Uplands section described by Reschke (1990). There is much ecological information present in this section of the crest to provide a template for environmental restoration should the Robert Moses Parkway be removed, and even if this were not to eventuate, to provide a template for more appropriate replacement and maintenance regimes by the several government administrations that maintain the area in the public interest. This manuscript has benefited by a review by Bob Baxter. Reschke, Carol. 1990. Ecological Communities of New York State. New York Natural Heritage Program, N.Y.S. Dept. Environmental Conservation, Latham, New York.